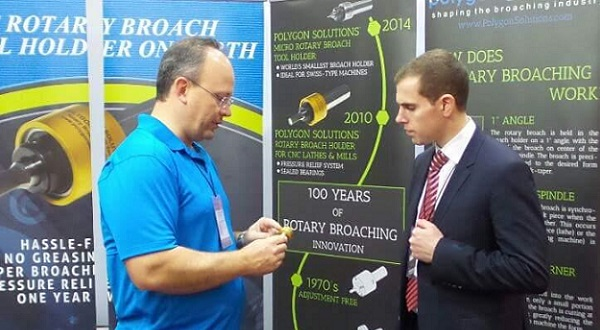 Polygon Solutions Inc. is a U.S. manufacturer of rotary broach tools used to make orthopedic bone screws, aerospace fasteners and vehicle components. The company started in 2010, and continues to expand its product line and customer base. The new exhibit at the Expo Manufactura show in Monterrey, Mexico is a sign that the company believes North American manufacturing will continue to grow. “We’ve been looking at the data and believe that focusing some of our attention on our neighboring international markets will create a significant source of revenue for us in the future,” says Peter Bagwell, a Product Engineer at Polygon Solutions Inc. “Some of our first customers were from outside the U.S., and we’ve been watching the reshoring efforts and simultaneous skills shortages in the U.S. and think there’s going to be an opportunity for us there.” Much of the data Bagwell refers to came about by assistance from the State of Florida and the U.S. Commercial Service. “When we joined the Southwest Regional Manufacturers Association in 2012, we were looking for help finding local resources and suppliers,” says Bagwell. “Ironically, at one of the meetings, Max Stewart, a Regional Manager for Enterprise Florida, explained a program that they were using to help small business with exporting, and it really caught our attention. With the exception of our website, most of our efforts were focused on U.S. business.” Polygon entered the program and was assigned to an International Trade Consultant from the FSBDC at Florida Gulf Coast University. Polygon plans to participate in at least 5 or 6 other events this year, but this is the first time the company will travel outside of the United States. If successful, Polygon is planning to travel to other countries next year. The company’s innovative inch and metric rotary broach tools can be used on virtually any lathe, mill, or CNC turning machine in the world.